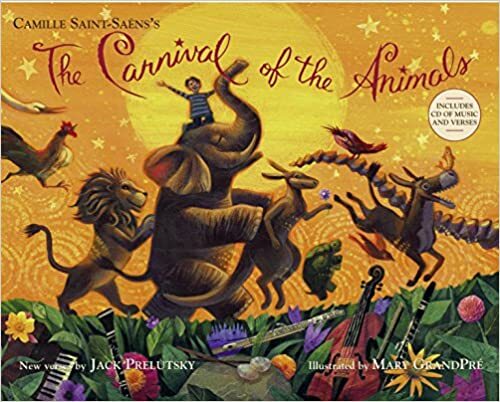 Each term we enjoy learning about a different composer – this term we are getting to know Camille Saint-Saens and his Carnival of the Animals. Our youngest was given this beautiful book for Christmas so it was a natural fit. We might read a living picture book about the composer giving us a bit of biographical background. Stick up a portrait of the composer by the kitchen table so we can put a name to a face. Play the music in the kitchen as we go about everyday life – often at mealtimes. Once a week we spend about 10 minutes sitting down and listening to just one movement of a piece of music or in the case of Carnival of the Animals we have listened to a few animals each time. We discuss the instrumentation, the dynamics, tempo, rhythm and mood of the piece. When we were starting out we obviously had to learn the instruments of the orchestra and all about dynamics and tempo. We have found SQUILT music appreciation lessons invaluable for this. I’d highly recommend their curriculum. I’ve also jotted down a few other books and resources that we’ve enjoyed. The Story Orchestra: Four Seasons in One Day – a beautifully illustrated book with buttons to press to hear Vivaldi’s music. This is much loved in our home. Opal Wheeler’s Mozart, the Wonder Boy is one example from a series by Opal Wheeler that we have loved. Delightfully written living biographies for children introducing them to composers. The Classical Kids Collection A set of story CDs (mp3 also available). Each introduces a different famous composer through a story with their music playing in the background. These have been loved in the car over the years. Classics for Kids is a podcast, which has wonderfully simple and short introductions to various composers – each podcast is about 5 minutes. We sometimes listen to them over supper, often accompanied by a request for “just one more”!